I know that it might make sense in my role as BGG News editor to pay attention to the most anticipated games from the hottest designers when deciding what to preview in this space, but I possess a love of the unusual and unexpected, a desire to explore games that present a playing experience unlike anything I might have imagined on my own, which is exactly what is delivered by Stonehenge and the Sun — a game from Naotaka Shimamoto and itten on Kickstarter through mid-January 2019 (KS link). Stonehenge and the Sun originated as part of a gaming/art/creativity exhibit titled "Is This a Game?" in Tokyo, Japan in late May 2018. Ten Japanese publishers participated in this event, with some of them submitting multiple games — or "games" if you wish. Oink Games, for example, submitted VOID, which contained lots of game-style bits but no rules for how to use them. Instead players were challenged to create a game scene with these bits, then post a picture of this scene on social media, with the player who received the most thumbs or likes winning the game. You might think of VOID as having only a metagame, with no game present to support the meta. Publisher itten submitted four works, each of them featuring historic relics in some manner. 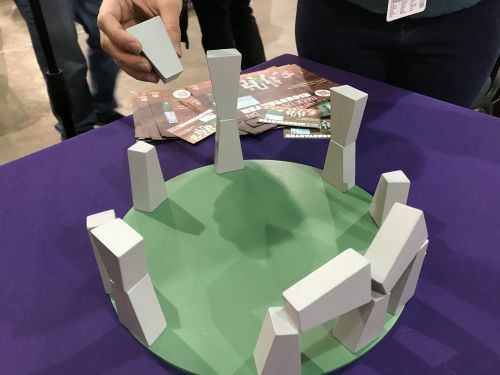 Of Stonehenge and the Sun, they write on the KS project, "Although there were only a few rules for it at the time of the exhibition, the game immediately caught the attention of the visitors and was enjoyed by many who stopped by." 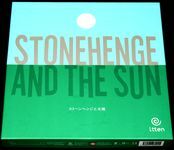 Shimamoto apparently reworked Stonehenge and the Sun following this exhibit to make it more of a proper game, and in the final design gameplay is simple and straightforward. In general, on a turn, you place a block from the reserve on the perimeter of the circular playing area, then you move your marker to either side of this block, then you must "swing the sun" across the entire playing area, with the sun passing through your area during this arc. The sun is represented by a heavy metal ball that's suspended from the ceiling, a chandelier, a tripod, or something else that can be placed above the playing area, and to swing the sun, you hold the ball at least a few inches away from the edge of the playing area, then you throw it or let it drop (with another player catching it on the far side of the board or else it will keep swinging back and forth, wrecking everything you've all built). If you knock over any blocks, you keep them as penalty points, and when the game ends, whoever has the fewest penalty points wins. The game has a few more details — you can place one block on top of another, you can create a Stonehenge-style gate by picking up a block on the board and balancing it on two pillars, you can't place your marker in an area occupied by another player — but that's pretty much all you need to know in order to play. And "play" is the optimal word here because the gameplay experience provided by Stonehenge and the Sun — which I've played six times on a review copy from itten —is very much akin to...just play, as in playing with toys or fooling around with found objects. 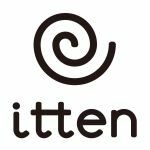 With this design, and other itten releases such as Tokyo Highway, you start looking at the things surrounding you in everyday life and wondering how they could be incorporated into a game. You start seeing games everywhere you look, and not in a we're-going-to-inspire-you-to-recycle-by-giving-you-points-for-it gamified type of way, but rather in a we-can-make-an-actual-game-out-of-these-plastic-bags type of way. Games are permeating everything around you — or at least they could be with the right mindset, and Shimamoto shows how this can happen.